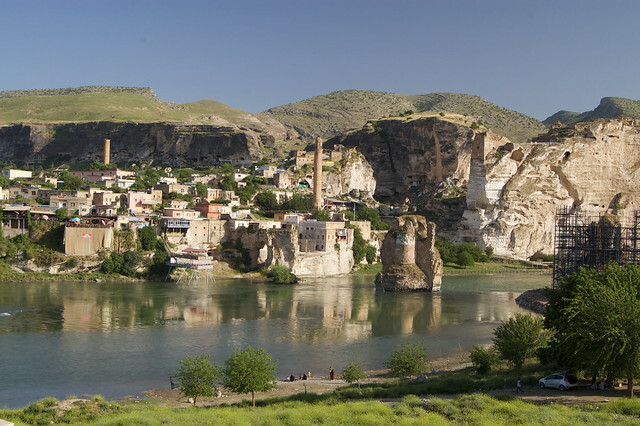 Sitting on the banks of the Tigris River in south-eastern Turkey, not far from the border with Syria, the 12,000-year-old settlement of Hasankeyf has been home to almost every major Mesopotamian civilization. From Neolithic caves to Roman ruins and Medieval monuments, Hasankeyf is a living museum of epic proportions. Most of the archaeological remains visible today date from the 12-15th centuries. The pylons of the Artukid Bridge and the minarets of the two Ayyubid mosques still dominate the skyline of Hasankeyf, while the Zeynel Bey Tomb is the only remaining example of Timurid architecture in the country. The ancient city of Hasankeyf and its surroundings was classified as a First Degree Archaeological Site by the Turkish government’s Supreme Board of Monuments in 1978. Despite its exceptionally rich multicultural history and heritage, 80% of Hasankeyf will be flooded if the Ilısu hydroelectric dam project is implemented as planned. It is estimated that the Ilısu dam will produce nearly 2% percent of Turkey’s electricity supply and generate direct annual revenues of 450 million euros. The State Hydraulic Works (DSI) plans to relocate some of the major “cultural assets” to an archaeological park. However, there is no internationally recognised scheme for the relocation, protection and conservation of the monuments. The building of the dam could be completed within months. Non-official projections indicate that construction works might continue throughout 2017 and that the huge reservoir will not start to be filled before 2018. The revised timeline opens up new opportunities for a team of independent experts from various fields to formulate a strategic plan that balances conservation and sustainable development. Hasankeyf attracts hundreds of thousands of visitors each year; it is predicted that this could increase to 2 million and that the revenue could reach 500 million euros per year. It is noted that this figure, which has already been surpassed in Göreme National Park in Cappadocia, is higher than the anticipated direct revenues yielded by the Ilısu dam. In addition to the threat of flooding, other major challenges to be met are insufficient planning, unregulated development, inadequate restoration and neglect. Hasankeyf presents a rare opportunity to achieve local aspirations for economic advancement and the preservation of local traditions, beliefs and practices by developing a model for public-private partnerships in conservation and economic development. The Municipality and District Government of Hasankeyf, the National Directorate for Archaeological Excavation and the State Hydraulic Works share responsibility for the administration and supervision of the various public and private properties of Hasankeyf. The nomination for ‘The 7 Most Endangered’ programme 2016 was submitted by the Cultural Awareness Foundation (Kültür Bilincini Geliştirme Vakfı) whose campaign is supported by a range of national and international bodies.